Faith moves in triumphant progress Up the shining aisles of prayer. My soul doth wait in the silence To see what the Lord will speak. Knowing His perfect wisdom Has an open door for me. To hear what the Lord will say. The subject of prayer is of vital importance to every human heart, because the hopes and the destinies of mankind depend so largely upon what men believe concerning the willingness and the power of God to answer prayer. That He does hear and answer those who call upon Him, millions have believed and have proved. "All things are possible to him that believeth. "— Mark 9:23 (A.V.). Knowing that we are able to learn to pray with understanding and always get an answer, we can come to the study of prayer with wholehearted interest. True prayer is conscious communion with God, or a common union of the human consciousness with the Father within, the principle of Absolute Good. 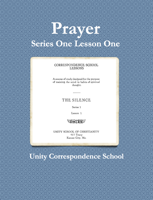 Unity's method of prayer is the Silence and it is reached through orderly steps in thinking and feeling. Jesus promised, "And all things, whatsoever ye shall ask in prayer, believing, ye shall receive.— Matt. 21:22. He gave some clear, definite instructions about how to pray, and He gave The Lord's Prayer as a model. These instructions and this prayer furnish all necessary information to one who would pray the fervent, effectual prayer that avails much. First, Jesus warned against praying for the purpose of being seen and heard by men; then He taught the true way: "When thou prayest, enter into thine inner chamber, and having shut thy door, pray to thy Father who is in secret, and thy Father who seeth in secret shall recompense thee." — Matt. 6:6. The key word in this text is "Father." The first and most important point in the study of prayer is to understand the true character of Him to whom we pray. Hardly less important is it that we understand our relation to Him. Jesus called Him "Father" and taught us to approach God as children would an earthly parent. "After this manner therefore pray ye: Our Father. . ." — Matt. 6:9. Jesus understood how to reach the people of His time by the word "Father." Had He referred to God as Principle or as Mind, the word would not have conveyed to the people the same understanding that "Father" conveyed. It was customary for them to refer to "Father Abraham," "Father Jacob," and others, and to like to claim their relationship, to like to think that they had proceeded from these "fathers" and were possessed of the same characteristics. By this word, "Father," Jesus tried to show them their divine origin, and have them really understand that they truly possessed the same qualities as God, the source from which they came. In using the word "our," He was claiming this same relationship for all, thus welding humanity into a universal brotherhood, all originating from the one Cause. This relationship suggests love. "God is love." — I John 4:8. To bring this close to us the Scriptures give these comparisons: "Like as a father pitieth his children, so Jehovah pitieth them that fear Him." — Psalms 103:13. Those who fear Jehovah are those who stand in holy awe and reverence before Him. "Or what man is there of you, who, if his son shall ask him for a loaf, will give him a stone? — Matt. 7:9. "If ye . . . know how to give good gifts unto your children, how muoh more shall your Father who is in heaven give good things to them that ask him?" — Matt. 7:11. Have you prayed, yet failed to receive? Perhaps you fail to receive because you do not go to God as to a Father, believing in His loving readiness to give you good things. The better our understanding of the character of "our Father," the greater will be our consciousness of faith, and the more certainly shall we receive. Great light is thrown upon the true nature of God by the statement of Jesus, "God is Spirit; and those worshiping must worship in Spirit and Truth" (Emphatic Diaglott). This does away with the belief that God is a man and far removed from us. Spirit is Infinite Mind, always and everywhere evenly present. Paul thus describes this omnipresent One and our relation to Him: "For in him we live, and move, and have our being." — Acts 17:28. God is everywhere evenly present, but it is within man that conscious union with God is made. Jesus refers to this inner place of union as "thine inner chamber," and the Psalmist calls it the "secret place of the Most High." — Psalms 91:1. One Bible translation refers to it as "thy closet." "Enter into thine inner chamber" — that is, turn your attention from the without to the within. "And having shut thy door, pray." To close the door is to still the five senses that connect one directly with the outer world. They will keep calling the attention without, if they are allowed to do so. Closing the eyes helps very much in closing the door to the outer world. Then "pray to thy Father who is in secret." This inner closet of prayer is the secret meeting place between God and man. It is a place of stillness, of silence, so we speak of entering it as "going into the silence." How may one bring his thoughts under his conscious control? It is no cause for discouragement if one is not able at first to enter this secret place or to close the door on the outer world. The senses are habitually active in the exterior consciousness; this habit is not overcome all at once, but by daily practice of denials, of affirmations, and of constantly aspiring toward the divine standard of thinking and feeling. It is well to have a regular time for prayer, but the mind should also be trained to "pray without ceasing, (I Thess. 5:l7) that is, the ability to turn within at all times in conscious communion with God should be sought by a continuous realization of God as ever present, "over all, and through all, and in all," (Eph. 4:6) and waiting always in the secret place when one turns the attention there to meet Him. What we shall say in the secret place is a secondary matter. The first and most important affair is to be still and know God. "Be still and know that I am God." — Psalms 46:10. Paul, in speaking of the innate desire for God in all men, says that God "made of one every nation of men . . . that they should seek God, if haply they might feel after him, though he is not far from each one of us: for in him we live, and move, and have our being." — Acts 17: 26-28. In the silence or stillness we feel after God, and great is the blessing when we get so still that we feel His presence filling and thrilling us with His life and love. In this consciousness one places the right value on the things of the world, because he becomes more fully aware of and appreciative of his blessings. We know what is meant by the promise, "But seek ye first his kingdom, and his righteousness; and all these things shall be added unto you.' — Matt. 6:33. The familiar Lord's Prayer (Matt. 6:9-14 and Luke 11:2-4), will have new meaning to us when prayed in the silence. This prayer is filled with the life and the substance and the power of Jesus' realization of Truth, and it will open with a new meaning as it is prayed to the Father in the "secret place." What benefit comes to us from praying to God as "our Father"? "Our Father." The simplicity and the majesty of this term are impressed upon one when he thus addresses God in the inner closet and meditates upon His character. "Who art in heaven." This has been taken to mean "who art in the skies," but such an interpretation is misleading. Jesus says, "The kingdom of God is within you." — Luke 17:21. Having learned the true nature of the Father, we can no longer think Him separated from us. Heaven is the expanding consciousness of the kingdom of God, and is an omnipresent spiritual reality. We find it within when we find God. It is the realm of perfection and order and life and love and peace and wisdom. What is it to "hallow" the name of God? "Hallowed be thy name." Hallowed comes from a word that means wholeness. God's name is "I AM" which is wholeness and perfection. It should be so realized by us. "To hallow" is to make whole, sacred, pure, holy, perfect. You are His character, His being, His expression. Are you seeking to bring forth that perfection, the reality of your spiritual nature? Stop and ask yourself these questions: "Am I, the expression of God, hallowing His name? Am I being that which God is? Am I bringing forth in thought, word, and deed—in mind, body, and affairs—the perfection which I really am?" What is "God's will" for man? "Thy kingdom come. Thy will be done, as in heaven, so on earth." We have learned that the kingdom of God is always, everywhere evenly present. This is a prayer that it may come into expression and be manifest in the earth, the outer, as it is in heaven, the inner. Thus it is that God's will is done. The great moving force that tends toward perfect expression in the universe, in man, in nature and in everything is the will of God. God's will is God's plan, purpose, intent and pleasure for man and all creation. It is very necessary in praying, "Thy will be done," to remember that His will for us is always good. He is love; He wills not that His children shall suffer in any way, but that they shall come to the knowledge of Him and be blessed with His wholeness. What is "our daily bread"? "Give us this day our daily bread." Jesus said, "Man shall not live by bread alone, but by every word that proceedeth out of the mouth of God." — Matt. 4:4. This petition, then, must have a larger meaning than is commonly believed. "Daily bread" means more than the food that is eaten physically. "Dally bread" is divine ideas that feed and nourish the soul and build states of consciousness that accords with the will of God. There is a substance in true words and no one lives life to the fullest unless he feeds upon words of Truth in dally prayer and meditation. "And forgive us our debts, as we also have forgiven our debtors." There is a law involved here. According to this law we cannot be forgiven until we first forgive. This would be seen more clearly if the prayer were put in the affirmative form, thus: thou dost forgive debts as we forgive our debtors. "And bring us not into temptation, but deliver us from the evil one." All things originate in mind, and evil comes from wrong thinking. To be delivered from evil is to have the mind cleansed from all belief in evil by the Spirit in us, by prayer find meditation. In this way wo are delivered from evil, delivered from the very last one of the thoughts of evil that may be in mind. So long as one false thought or belief remains, our mind needs the purifying power of the Christ Mind. One of the secrets of the prayer of demonstration is revealed in this promise: "All things whatsoever ye pray and ask for, believe that ye receive them, and ye shall have them." This is mysterious only until we see that it is the way of faith. "Faith is the perceiving power of the mind linked with a power to shape substance." — Prosperity 43, by Charles Fillmore. Faith shapes substance into the desired form or shape. At the tomb of Lazarus, before Lazarus came forth, Jesus said: "Father, I thank thee that thou heardest me. And I knew that thou hearest me always." — John 11:41-42. He knew that He had the answer, even before He saw it manifested. When He increased the loaves and the fishes, He gave thanks before He saw the demonstration. To claim the answer and to give thanks for it, unwaveringly believing in God as absolutely unfailing, even before you see the proof, is one of the greatest lessons that can be learned in connection with prayer. This is the prayer of faith. With God "can be no variation, neither shadow that is cast by turning." — James 1:17. All that He is, all that He does, all that He says, are exact law and can no more fail than following the rules in arithmetic can fail to produce the correct answer. This is the basis of our faith in prayer and this is why it is absolutely safe to claim the good He has promised and give thanks for it before we see it manifested. How does one come into conscious unity with God? This claiming of what is ours in Truth we call affirmation. Jesus was bold and fearless in making the highest claims for Himself. He affirmed, "I and the Father are one," (John 10:30) and, "All things whatsoever the Father hath are mine, (John 16:15) and so raised Himself above the prevailing thought of the world. In this way He demonstrated His sonship. He is our example; He came to teach us how to attain the realization of our sonship. We can attain this realization by following in His steps, by doing as He did. He said, "Judge not according to appearance, but judge righteous judgment — John 7:24. In the realm of the mainifest world all about us, many things appear true that are not true in Spirit, and we are freed from the habit of judging by appearances and established in the consciousness of the Truth of our being by the prayer of faith made in understanding. our being." — Acts 17:28. There is in reality but one Being. , feeling these qualities or ideas within you, and then you are to make them manifest. The belief of separation of our being from God's Being is only a part of the falsity that comes from judging by appearances. We overcome this by claiming, affirming, praying in faith, "I and the Father are one." — John 10:30. The first step in entering the silence is to think of the presence of God; the second step is to feel oneness with God, the Good. Upon these two fundamental steps all true prayer rests, for thinking and feeling build consciousness. What is meant by "holding a thought" as used in connection with prayer? Students of practical Christianity sometimes speak of "holding a thought." This means that they take some statement of Truth into the silence, repeat it over and over, and meditate upon it until they realize its meaning, until it becomes alive in consciousness as spiritual understanding. This is the way to come into understanding. It is natural for the one who is yet in ignorance of the great all-knowing One within him to want to seek here and there of some man or some book for explanation of various texts of Scripture, but the only way to come into the knowledge of Truth is to seek the kingdom within. Teachers and books are helpful because they turn our attention within and help us to have faith in our indwelling Lord. The power to "hold a thought" is the power to concentrate upon an idea. Concentration, as used in its application to spiritual development, means the act of fixing the attention upon a central idea and drawing all the thoughts to that center. The thoughts of men require discipline. Thinking to a purpose must take the place of thinking at random. The silence gives thought discipline. Power to direct and control thought comes not from the personal will but by centering within, in I AM. Thus poise and self-control are attained in our thoughts and feelings, in realization. If our prayers seem not to be answered, let us not accuse God of failing us but let us examine ourselves to find whether we have truly prayed with understanding. Have we directed our prayers within, or without? Have we prayed to God as Father, or as the "unknown"? Have we known ourselves to be one with Him, or have we thought Him separate from us, perhaps a long way off? Have we entered the inner chamber of prayer? Have we closed the door? Have we asked believing that we have received? Have we prayed, desiring, above all, the kingdom of God; have "things" been first in our minds? Have we forgiven? God is the all-surrounding, all-penetrating Spirit-Mind, out of which all come. I live; that is, I am animated and inspired by and through Infinite Mind. I breathe into my lungs that which is necessary for the life of my physical body, and my mind is inspired with divine ideas, ideas of good which are in this Mind. I am ever in the presence of this Almighty One, and am being the qualities or attributes of God to the extent that; I know them. I am God-life, God-intelligence, God-substance, to the degree of my understanding. A fish lives in the water, its natural element, and moves and has its being there. An animal lives and moves and has its being in the air, its natural element, that which is necessary for its well-being. Spiritually, I am an idea in God-Mind, and I live and move and am the expression of God-Mind. I am sustained and eternally supplied with its substance through right thinking and by not misapplying or misusing any of its ideas. I must learn to do this consciously; through choice I am to keep my thoughts on the good that is in and around all. In this way I consciously live and move and have my being in God.